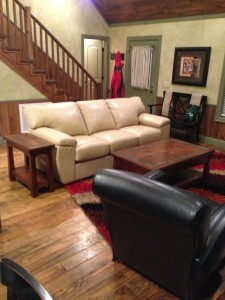 We just finished redecorating the Empty Creel Lodge with all new leather furniture and new tables. What a great place for a yellow lab to take a nap! If only I could convince Bo to let me on the couch. We have to thank Bo’s brother, Rick Goins for his help with this project. Rick has a great selection of leather furniture at his store, Goins Statewide Furniture at 900 Garrison Avenue in downtown Fort Smith, Arkansas. When booking your fly fishing trip with Empty Creel Fly Fishing Guides and Outfitter be sure ask about staying in the Empty Creel Lodge. We can easily accommodate four anglers and we can also make arrangements to provide breakfast and dinner. There is plenty of parking and even room for your boat. There is a great area for fly casting instruction and we have access to one of the best wading shoals on the Little Red River. It really is the best deal on the river!